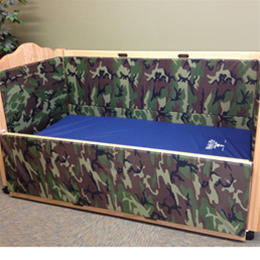 Designed by a family-owned company for special needs children, youth and adults who need extra fall and entrapment protection while in the bed. Each bed is handcrafted with solid woods throughout, with a choice of 3 woods and 6 different stains, with optional accent carvings, name engraving, canopy top, high side model, access ports and IV poles. Also, a choice of upholstery for padded beds. Mattress *Height to Floor: 14 - 36"
Rail *Height to Floor: 45"